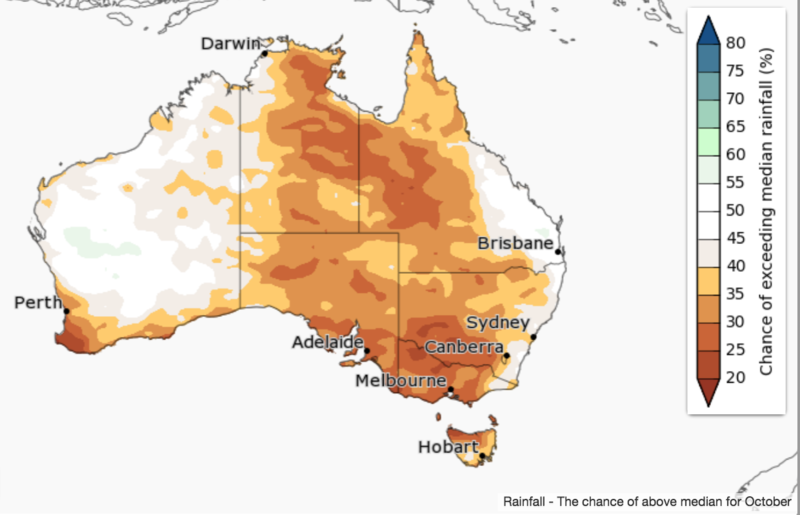 Spring is more likely to be drier than average for southwest WA, most of SA, the southern NT, inland NSW (west of the divide), Victoria, Tasmania, and northern Queensland, according to the Bureau of Meteorology’s three-month climate outlook statement released this morning. 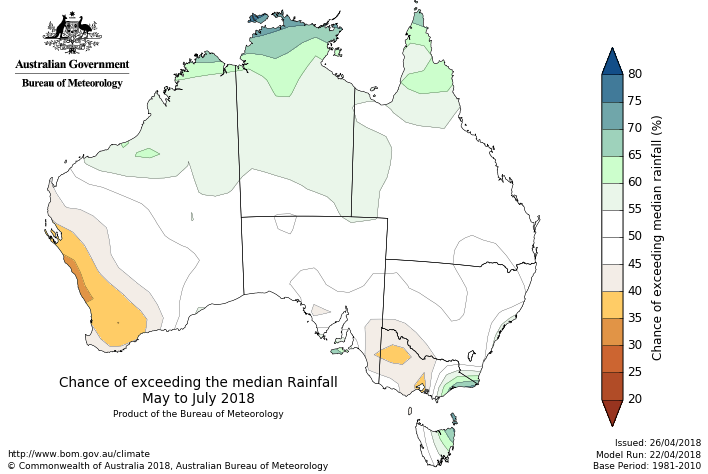 Elsewhere, there are roughly equal chances of a wetter or drier than average three months, meaning there is no strong indication either way that it will be particularly wet or dry. 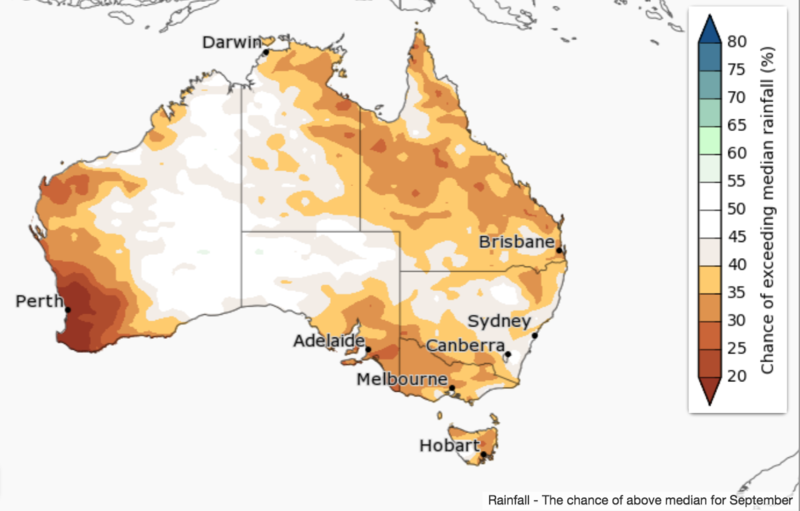 September is likely to be drier than average in western WA, the Top End and eastern parts of the NT, Queensland, northeast NSW, most of Tasmania, and Victoria as well as adjacent areas across the border in NSW and SA. 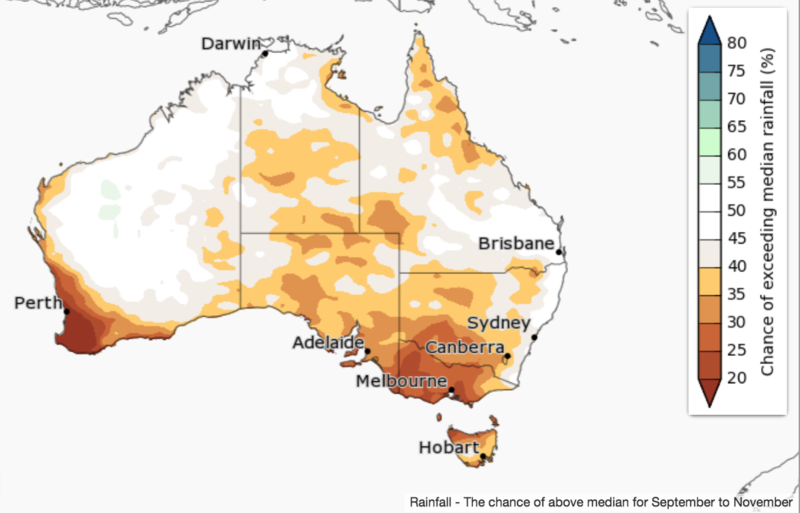 Much of eastern and southern mainland Australia have experienced a very dry winter and start to the year, so an outlook with increased chances of drier conditions indicates areas currently experiencing drought are less likely to see significant respite in the coming three months. Historical outlook accuracy for September to November is moderate to high over most of the country, except for western WA where accuracy is low to very low. 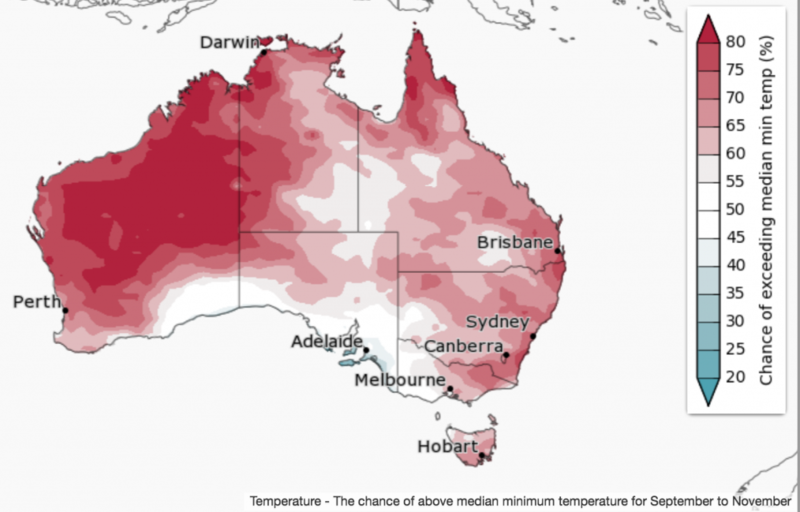 The above average daytime temperatures that have occurred across Australia so far in 2018 are likely to continue. 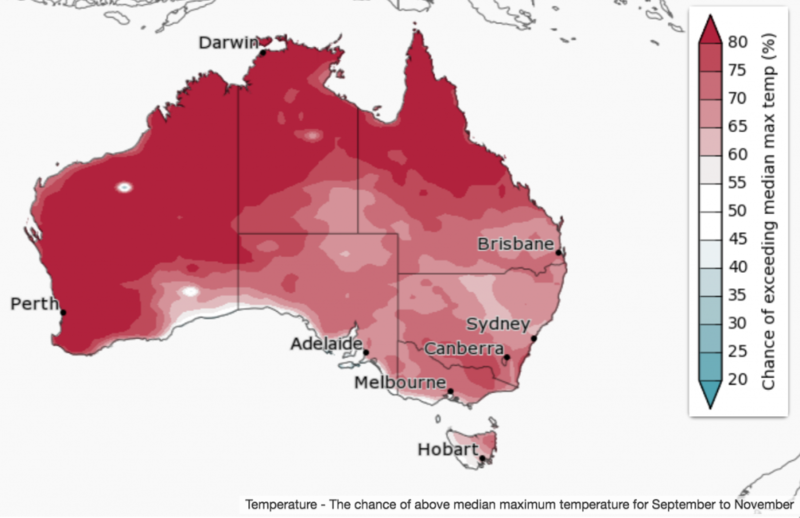 Spring days are likely to be warmer than average for Australia. With clear skies likely, the risk of frost and cold nights continue in the south, but overall, warmer than average minimum temperatures are likely in many locations. Historical accuracy for September to November maximum temperatures is moderate to high for most of the country. 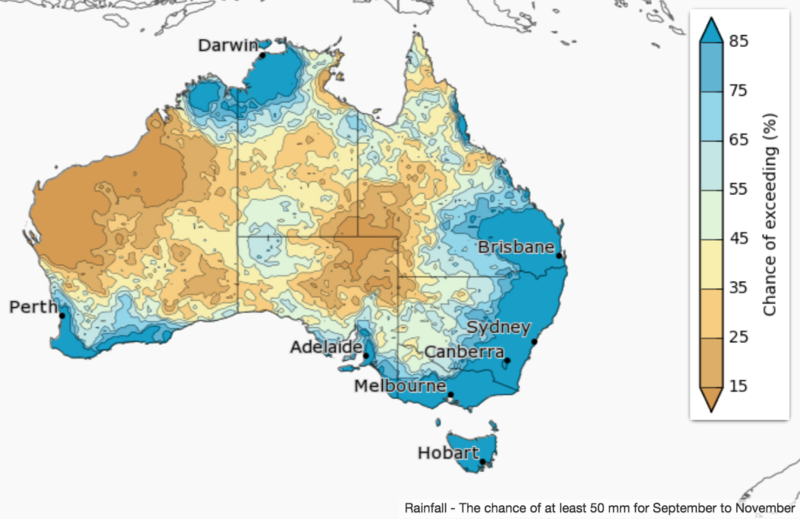 Minimum temperature accuracy is moderate for eastern Australia, the Top End of the NT, and parts of central Australia. Elsewhere, accuracy is either patchy or low to very low.